Strawberry Milkshake Traybake as made for an event in my local village hall. A couple of weeks back we had an event in my local village hall. I was asked to bake a couple of things to take along. I was surprised to be asked as it was an evening event. Usually cakes and bakes are meant to be eaten during the day but not alongside wine and nibbles. I presumed this was because there would be children there. So with this in mind I got baking one Saturday afternoon. I started with some flapjacks, then some Oreo Cookie Brownies and then decided to make a traybake. Traybakes, to me are perfect for big gatherings as they take no time at all to prepare and a little goes a long way. I thought a plain vanilla sponge would go down well and thought about a suitable topping. I went completely overboard with the heart shaped sprinkles and the purple edible glitter. Traybakes always go down well- a little always goes a long way. I also baked flapjacks, which go down well with people of all ages. I use a lot of Sugar and Crumbs’ natural flavoured icing sugars and their cocoa powders. Every now and again I get a few packets and stock up, trying out new flavours. Or I go back and repeat buy flavours I know everyone loves. This is what happened with their Strawberry Milkshake flavour. Last year I tried making some cupcakes with strawberry milkshake flavour buttercream. 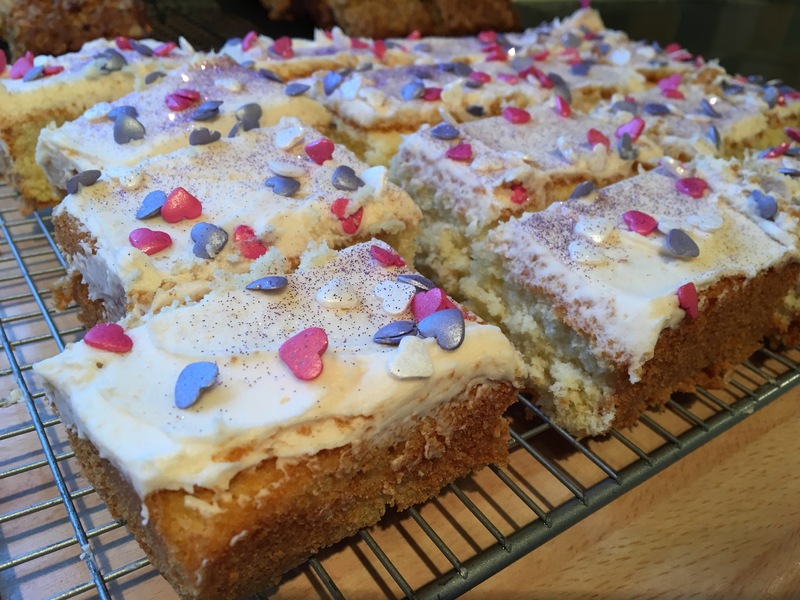 This time I decided to make up some buttercream and put it on the top of the traybake. I also had some pastel coloured heart sprinkles and some edible glitter to finish off the decorations. As expected the traybake went down well with the children and not so much with the adults. After all, who wants to eat cake with wine? I had also eaten my dinner quite late that afternoon and was still full up from then. There were a few bits left. I was still happy with the result though and will make another traybake like this another time for a coffee morning. Previous Post Portuguese Pork and Rice- Mary Berry Everyday. Next Post Chocolate Orange Star Cookies.